We know that many of you would like a more environmentally-conscience way to purchase your cider. With this in mind, we'd like to offer you a way to decrease waste, save money, and ultimately, get the cider to you that you love. 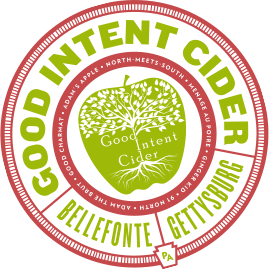 Good Intent is launching a growler exchange service at the Boalsburg Farmers Market. Each week you order a growler online by Monday evening and pick it up on Tuesdays between 2 and 6pm. Super easy! Signing up costs no more than the typical $8 per growler but we'll have two growlers in circulation just for you (essentially you get a second growler for free). Just to remember to wash out your empty growler and bring it back to us at the market when you pick up the next.